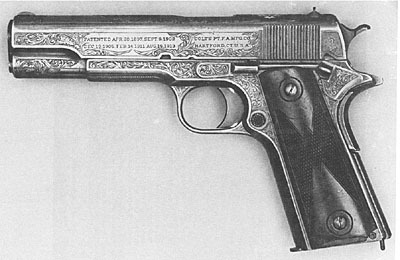 Commercial Colt "Government Model" serial number C93183 - factory engraved and gold inlaid by William H. Gough. Gold inlaid monogram of the letters "FHC" on the top of the slide, forward of the rear sight. Varnished and checkered walnut grips of a pattern associated with Gough. Shipped March 27, 1917 to J.P. Shannon, Philadelphia, PA at the request of Murta Appleton & Co. Approximately 140 Model 1911 and Model 1911A1 pre-WWII pistols were engraved, seven of the 140 are known to have been gold inlaid.